Reading and share top 10 famous quotes and sayings about Eric Clapton by famous authors and people. 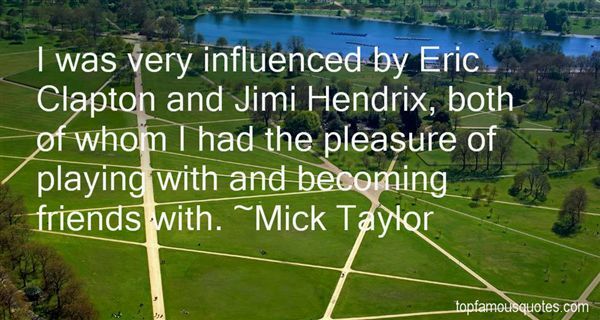 Browse top 10 famous quotes and sayings about Eric Clapton by most favorite authors. 1. "Don't you think women would be happier if Layla had a whole chorus about Eric Clapton watching Patti Boyd trying to climb over a park fence, pissed, in order to retrieve a shoe she threw in there, for a bet?" 2. "Eric Clapton is my dream guitarist." 3. 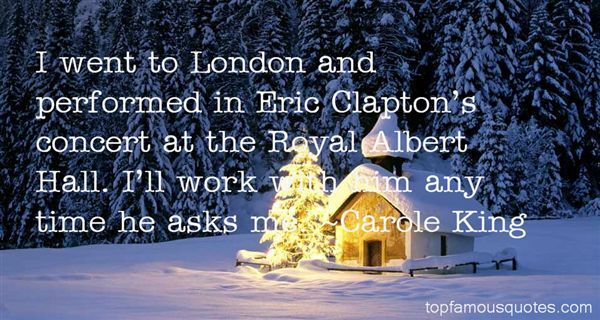 "I went to London and performed in Eric Clapton's concert at the Royal Albert Hall. I'll work with him any time he asks me." 4. "Punk was sort of an angry stance against things that had happened just before, against the pop of glam rock, against progressive rock. Music had become very staid and it was about the playing and people obsessed. Eric Clapton was God and we needed an enema within the art form, and punk did do that." 5. "I can never make up my mind if I'm happy being a flute player, or if I wish I were Eric Clapton." 6. "I know he played on the last record but I don't wake up in the middle of the night thinking of Eric Clapton." 7. "I was very influenced by Eric Clapton and Jimi Hendrix, both of whom I had the pleasure of playing with and becoming friends with." 8. "It's one of those songs— like Eric Clapton's "Tears in Heaven"— that everyone knows all the words to without ever having chosen to learn them." 9. "Eric Clapton always wanted to come out onstage with a stuffed parrot on his shoulder." 10. "I'm no spring chicken. The same arthritis that ate up my left hip that finally got replaced hasn't stopped there... And touring is a lot of work. 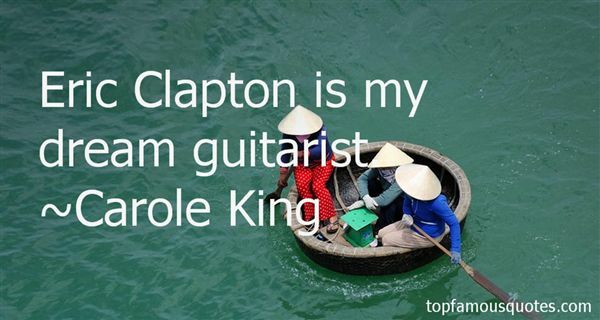 I'm impressed when I see people like Eric Clapton out there. Gee whiz, Eric, give me a break! I know it's gotta hurt somewhere." How many types of curtains can there be? When I asked the salesman this, he banged on the organ and bellowed with laughter. But I saw those feet fidgeting. He just didn't know."